Kanoni in the peninsula of Kanoni, from here you have the best view to the Mouse island which is the famous landmark of the island. Next to the Mouse island is Vlacheraina with the church of Madonna and at the west is the runway of the international airport Ioannis Kapodistrias. The distance from El Greco hotel is only 2 miles. Huge plaza that was created in the Middle Ages by the Venetians when they destroyed hundreds of houses to use their materials in the construction of the new fortress, the largest square in the Balkans, located west of the old fort, in this square many events taking place, here is the ceremony of Easter of the famous Corfu Easter, also some cricket matches are happened here, a purely English sport that remained from the period of British rule. There are beautiful buildings, some dating from medieval times, as is the current City Hall in Eugene Voulgareos Street, built in 1663 as the arcade of the nobility and later became the theater of San Giacomo. The neoclassical building which housed the Ionian parliament and is located on Napoleon Zabeli street, The Ionian Academy on Academias Street, a building constructed by the Venetians. The palace used by former royal family as the summer residence and is opposite the Paleopolis, namely the ancient Corfu, now belongs to the Municipality of Corfu and it is transformed to a museum. Several very old churches, most of Italian style as the church that houses the sacred relics of the patron saint of Corfu Saint Spyridon, is located on Iroon Polytechniou square at the Street of Kalochairetos. 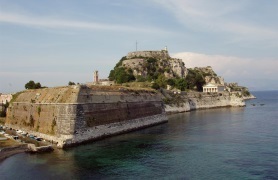 It is the ancient city of Corfu, between Kanoni and Garitsa with the ancient temple of Artemis and other findings. The buildings with the famous "arches", the most "walked" part of the city, lays west of the square Esplanade, built by the French of Napoleon, is now among the most "in" places in town. 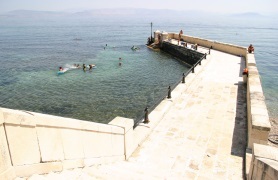 At the sea ​​beneath the Achilleion palace, it was the place for swimm for the German Kaiser Wilhelm. Benitses is very close to ElGreco hotel, just 1 mile to the south and always has been one of the most important tourist destinations of Corfu. The tourist resort had experienced tremendous growth since the decade of 60's and later decades of 70 and 80, even now it is still of the largest tourist resorts while one of the most beautiful and authentic traditional sites of the island. 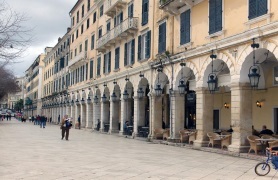 From our hotel, Benitses abstain 10 minutes away and it might be your first stop during your holiday in Corfu. In Benitses there is everything a visitor could ask for, from large hotels, all types of rooms, clean sandy beaches with water sports, excellent restaurants for all kinds of tastes, cofe bars for coffee or anything else, Supermarkets, Tourist Offices, shops and souvenir shops, car rental and bike hite offices, and the nightlife despite the downturn of recent years continues to be intense and exciting. The village was formerly a small fishing village, today's residents, despite the dynamic occupation with tourism still always be associated with fishing at professional and amateur basis, there are always fishing boats in both the new marina that was created as a haven of tourist boats, and at the other creeks as the natural port of Koutsomaroula. 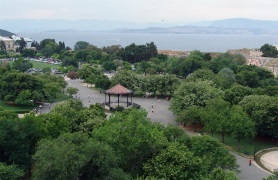 In Benitses, except the seasports and swimming you can find and see several sites and use the trails on the slopes of the mountain to explore the nature either by foot or by bicycle and by car where there the street is fairly wide, there are many paths to the top the Mountain of Stavros and a normal road for cars is well. In the aqueduct there are sources that supply with water big part of the island and the city of Corfu.Almost in the center of the village and next to main street there are well preserved ruins of ancient Roman baths, a sign that this area is inhabited since antiquity, also there are dozens of remote chapels on the mountain slopes. There is the Marine sea Museum, unique of its kind with a huge variety of exhibits, it lays a few meters below the Laopetra, a very distinctive almost floating stone at the northern entrance of Benitses just off the main road. And of course, Achillion Palace, right at the top of the hill on which our hotel is built, attracting thousands of tourists from all over the island. Built in 1890 by the Queen of Austria-Hungary Elisabeth which was known by the nickname Sissy, today the neoclassical building of Achillion, having gone through several phases, is now a museum and a place that certainly should be visited by who ever comes in Corfu.